Crone Hellebron was a cool extra I gained from the Cauldron of Blood kit and, while I never intend to field her, she was a great opportunity to test out a few techniques. First and foremost I used her to judge how pale I ought to go with the flesh on my Witch Elves and was a useful test model for them. I used 'Blood for the Blood God' on her for the first time to simulate blood. 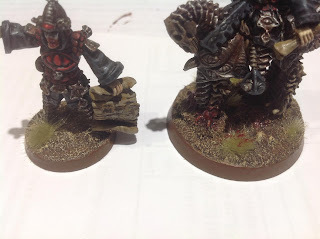 I tried several different applications including stippling, flicking it on, painting it in strategic areas and even mixing it with other paints to see what effect it would produce. All this perhaps creates what looks like an overkill of blood, which I would probably agree with but it was an informative period of experimentation nonetheless. On the base I used the 'Agrellan Earth' paint which I was a little underwhelmed by and I think would work better combined with some other basing materials rather than just alone. More tests are needed to see what I can do with this paint. I have recently found that I have actually painted nearly everything I own. All of my Middle-Earth stuff has been finished, all my Imperial stuff finished and all the fantasy stuff I own finished. At the moment I have my Dark Eldar I am repainting and a few Inquisitorial stragglers that need finishing off as the only things left. There are of course many models I want to buy but of the stuff I own you will probably see the last few bits over the next few months as I get round to photographing them. My only real ongoing projects after my intense painting sessions over easter are some pieces of terrain, Dreadfleet (which will probably never get finished) and some small Game of Thrones war bands I have been making from old Lord of the Rings miniatures.